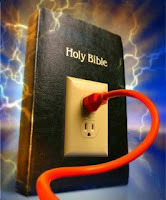 Empowerment Moments Blog: Plugged In To Power! Ever so often, by way of my ministry's Youtube.com Readers Digest subscription account, I would receive directly into my mailbox my own personal copies of video messages from different speakers, mainly from across the USA. I am always inspired by the word of the Lord through these great men and women of God which gives me hope, courage, guidance and strength. I am honoured to have each one to speak prophetically into my life. They are all workmen in God's vineyard who are worthy of their reward. I am especially honoured or rather humbled that divine providence would have me to connect with the ministry of Bishop T.D. Jakes. A father in the faith to so many around the world, a Patriarch others would say he is. The most recent of the messages, a four part series labelled "You Are Going To Be Blessed Outside Of Your Comfort Zone: Stirring Up A Blessing" by Bishop Jakes is revolutionary! It has the power to transform your life and to get your paradigm shifted into divine order. It has the ability to remove chaos and confusion out of your life and to bring peace and a sense of direction and purpose.......I was tremendously blessed by the messages and for the sole purpose of advancing the kingdom of God, and to bless His people as He alone gets all the glory, I share with you today. This was indeed a blessing. Thank you for sharing.